Fall (or autumn some might call it) is a beautiful time of the year. You may choose to agree or disagree, but hey when you take that walk in your parking lot and some dry leaves crush under your feet, you do feel a little bit of joy. The long drives can be so much better when it is no more the old boring green, and there is a touch of gold to the leaves. It's amazing how there is so much poetry in the air when it's the fall season! But who are we kidding here? We all know the things we hate about Fall! The end of summer, the viruses, the soon- arriving -murderous winter! So let’s discuss some super ideas about how we can make our “Fall Life” better. Let me present you with the ‘Top 5 Ways to Prepare for Fall’. Let’s jump in! So be mindful of this scenario. Keep your medicines close by, in case you need them. Keep healthy, by including veggies and fruits in your diet. Go for the hot instead of the cold food. Researches prove that heating food well kills maximum impurities in the food. Find your comfort food and prepare more of it this Fall. I have my go-to Soup that I make time and again (especially when someone is ill). Keep things around you clean; don’t let dust and dirt settle in the house, in the clothes, in your day to day dishes. More the dust, more the allergies and more the sneezes! Having a hypo -allergic laundry detergent really helps, especially if you have young children in the house. Keep Vapor Rubs in your pockets, they work like a charm for the cold, occasional steam baths can help a great deal too! No! I haven’t turned into a fashion blogger, but doesn’t Fall make us all feel a little more special? With all the woolens and the boots!! But this is important, and it goes beyond fashion. Dressing up correctly for the weather is crucial for your health, this way you can prevent catching a cold altogether. So keep your jackets ready and hanging, gather your hats, gloves, socks, scarves. Bring all your full sleeves out, and put away your summer clothes. For when you’re indoors, bring out all your comfort blankets and pillows, for when you want to curl up on the sofa and have fuming coffee, have a sweater/jacket for home, get those warm house slippers or socks whichever you prefer. Maintenance has to be number one here! Take your car for a good inspection; fix everything that needs to be fixed. Check your tires, fluids, battery and really everything else about your car. If your car is in a good condition and updated you can have a worry free fall ride. The next in line is a first aid kit. Now, it might sound like something obvious, but mostly we forget to do the most obvious things. So check your first aid kit, refill what is necessary, replace what is old, throw in some extra pain tablets, ice packs, heat pads etc. Take a look at an essentials list to make sure you do not forget anything important. Keep a bag of extra warm clothes in the car, because the cold weather can be unpredictable at times, also if you're traveling the long haul these clothes can become useful. Throw in extra blankets, depending on the number of members in your family, extra gloves, hat, socks, ear plugs, muffler and everything else you think might help. If you're traveling with children, I highly suggest you are well equipped with these extra warmers, you never know when you will need them. Other things that you must have in your car are a shovel, ice scraper, rock salt, ice melting spray. These might not be useful for fall, but it is a good idea to have them ready in the car for the upcoming winter months, just to be prepared. Cleaning your house is the key! Now would be a good time to clear out the clutter, giving in charity, discard old things that you don't use or like anymore. The reason is that you want to feel good in the upcoming dark- cold days. Since you will spend most of your time indoors, you might as well make it pleasant and comfy. Make space in the house, simply to move around! Also, deep clean your carpets to remove any dust that might be trapped in. Organize your cabinets and closets. Check your heating systems, change your air filters, make sure your windows shut correctly and entirely so that the cold air does not seep in! A lot goes on this time of the year; your work can seem never ending and tiresome. You or your loved one can be ill. If you have a child, you probably will be having numerous sleepless nights and temper tantrums. There will be fewer outings and outdoor activities. What is important amidst all of this is, that you keep your calm, learn to breathe and let go. Think of some family games and group activities that can be done indoors, think of a personal project that you can do with your children/ partner/ buddies. Start a fall tradition for yourself that can be taken forward for the years to come. Do you have a fall tradition? Share in the comments below!! 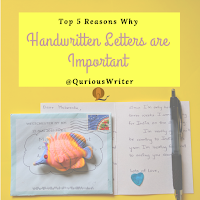 We don't have fall season as such here Ms.Qurious writer, bt it does sound very interesting. Very well written!!! 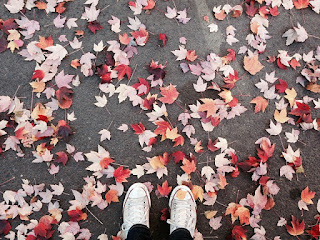 Thanks for appreciating, and if not fall then maybe a little bit autumn?? I have tried to generalise, I hope some of the points help you in your weather too! Potty Training!! If you cringed at these terrifying words, then you are in the same boat as me. 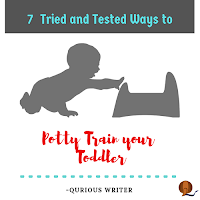 Potty training is probably the most feared and difficult phase of the parenting life. Even though it is a skill that toddlers will learn eventually, to parents it's a phase that needs so much work and dedication. Just when you thought, that the diaper changing days are over; the accident cleaning and sanitizing days knock you on the head. That's what we always think right? When they grow older it will all be better. Unfortunately, as they grow older they demand more attention, time, commitment and love. Part 2: What does Body Shaming Involve? This statement explains in a nutshell, everything I am fighting for! It's simple, whoever you are and however you look, be proud of it. That is the attitude that will bring you health, happiness and satisfaction for your body. To all of those who are following my Body Shaming series, this is part 2. 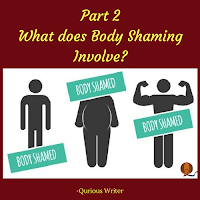 In the first part, ‘What is Body Shaming?’ we understood all about the concept (or trend) of body shaming, and some facts related to it. To all the new readers, you can read part 1 by clicking on the hyperlinks provided. In this part, let's understand the types of body shaming. Yes, there are types! It is really upsetting, but it is true…without any buffer, let’s get straight to it!